I am trying to think of both the best matches I have ever seen, and my best days at work. For instance, in 2008, there was the third Test in Perth against Australia. This followed the extremely controversial second Test in Sydney. India came back and won at a ground where they were expected to be blown away in threeand- a-half days. I remember saying then that Shaun Tait was going to bowl at 200km per hour and he was going to destroy. But India won. So from a cricketing and sporting perspective, that was a brilliant occasion. Another match that truly stands outfor me is the Twenty20 World Cup final in 2007, which India won against all odds. I wasn’t expecting anything. There was a sense of discovery about the whole format. No one knew where T20 was going to go. And as it turned out, one magical decision by M.S. Dhoni to throw the ball to Joginder Sharma and one moment of madness by Misbah-ul-Haq changed the future of T20 cricket. For if India hadn’t won that World Cup, T20 would never have become big in India. But it did become big...and the rest is history. Just think of that moment when Shahid Afridi walks into the ground and decides to hit Irfan Pathan first ball—and gets out. The game just changed in that moment. It was like going into the unknown. From the first match of that tournament...that whole T20 World Cup, in fact, was a journey into the unknown for all of us. If I had to be abandoned on a deserted island with a DVD of just one match, it would have to be that T20 World Cup final and...one other game that I must have watched around a hundred times, in various instalments over the years—the NatWest Series final in 2002. What makes these What makes these games great? One aspect is the fact that you don’t know till the very last moment how the game is going to swing. You are on tenterhooks throughout. And maybe something unexpected happens. A day to remember: V.V.S. 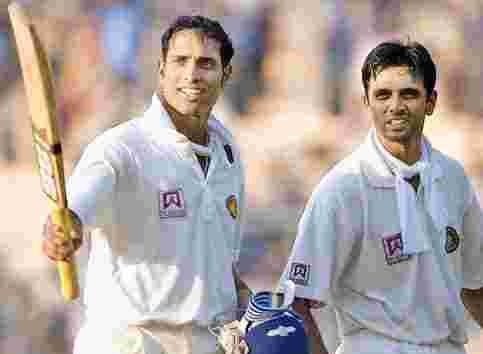 Laxman (left) and Rahul Dravid walk back to the pavilion unbeaten on the fourth day of the second Test between India and Australia at Eden Gardens, Kolkata, on 14 March 2001. It is not just about remembering great batting or great bowling. For me, it is about witnessing how a situation suddenly changes. Which is why I would remember that Test match more than the following Test match in Chennai. The next match was even closer. It was another brilliant Test match...Harbhajan Singh, Sameer Dighe all shined. But watching two batsmen bat the entire day, no one had seen anything like that before. An Indian batsman scoring 281, hitting the ball anywhere he wanted against McGrath, Warne and Gillespie...we will never see that again. When I think about it now, seeing an innings like that can impact the way you watch cricket in two ways. 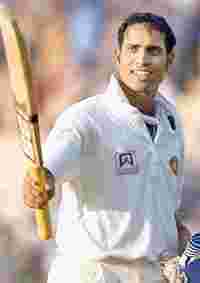 On the one hand, every time you see Laxman play, you think, “I’ve seen him do something special before. Maybe he can do it again". But then you also realize that what you saw was such a special moment, such a one-off achievement, that you will perhaps never see that again. Indeed, if tomorrow Laxman makes 281 again against an Australian attack, then his first achievement would cease to be unique. In fact, I think it would diminish his performance at Eden Gardens. The moments that stand apart are those once-in-a-lifetime events. Which is why, for me, the greatest moment in cricket has to be the India-Pakistan Test match in Chennai in 1999. Where the crowd gave Pakistan a standing ovation after they defeated India...in India! Will that ever happen again, given the political situation? Will it ever happen in Chennai again? After the match, I am in the middle of the stands somewhere, doing my closing piece-to-camera and I hear my producer saying, “Keep talking for the next 20-30 seconds, I am going to give you some pictures to talk over." And suddenly I see this Mexican wave...the entire Chennai crowd is giving Pakistan a standing ovation. I don’t think we will ever see something like that again. Is there a parallel for this anywhere else in world sport? I don’t think so. What an unforgettable moment. What a privilege to witness it. As told to Sidin Vadukut.